A week ago, Peter Vesel finished another stage race, this time JoBerg2c stage race in South Africa. Riders faced 900 kilometers of proper mountain biking across four provinces of South Africa. The race lasted from 22nd of April until 30th of April. As organizers said: “The Old Mutual joBerg2c is ride where the destination is less important than the journey. It is riding the off-roads less travelled and trails never travelled. It is about the variation and beauty of this incredible country. You will ride trails never ridden and you will meet communities you would have never known.” And so it was, Peter and Ivonne ended race in 5th place in the overall mixed category where Peter said: “Overall I think JoBerg2c is a great stage race. First few stages are on fast gravel roads but the last few stages give us some proper technical mountainbike trilsˮ. At the end of stage race Peter said he was a little bit tired but now thing have been put in the right place. The most beautiful stage was 8th, where the trail, landscape and fans were amazing. He never experienced something like this before. Moreover, he even said that because of such beautiful landscape he sometimes felt tempted to stop for a minute and just enjoy the view. We were also interested in how much he had to prepare for the race. Peter told us that as he is training both on mountain bike as well as road bike, his practiced during one week are accumulated from seven to twenty hour per week, depends if preparing for something or not. However for him important part is also traveling to the place of the race. Whole travelling from home to house they (Peter and his family) were staying in the early days of the race in Johannesburg lasted exactly 24 hours. Along his 60kg heavy equipment he was accompanied by his family. Although members had their own obligation and they were not together a lot because of the stages and responsibilities after, Peter said that the whole race is really different if family is with him. They spent time together especially after the race. However Peter said that at every race he gives the most out of himself. Although, during race, he had some problems with the valve at the rear of the ring, he managed to repair it at the shortest time possible. With the ending result, he is very happy; moreover he said he would not change anything. We also asked him about his whole career and which race left the biggest stamp. He answered that: “this is definitely the Cape Epic. Probably because it was my first stage race on a mountain bike. At this race I was 6 times”. In September we will also have a chance to see Peter three day stage race Trans Dinara, about other he stayed secret. 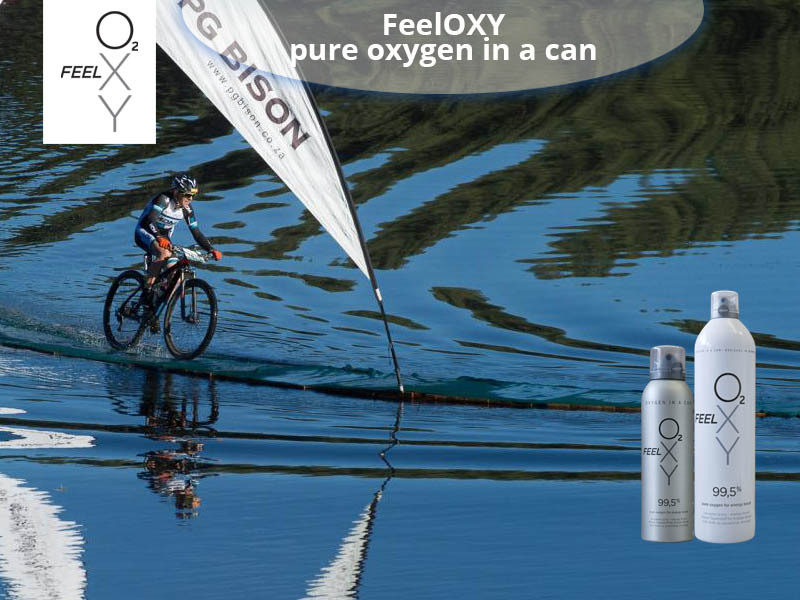 As for the end, Peter said that during race he used FeelOXY product as it helped him at the high altitudes from 1500 – 1900 meters.